After a week of clouds and endless rain, I decided to spend the afternoon outside cutting wood for the next firing and figuring out a way to move that 8' beast of a mixer out into it final working position. 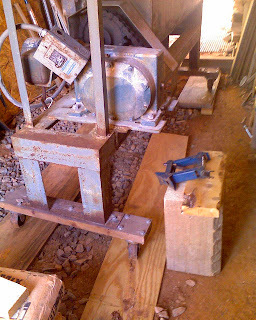 As you can see it wasn't too hard to get the wheels onto the plywood runner with my old Suburu jack. (I knew it would be handy someday!) 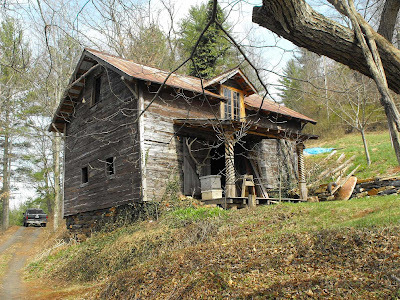 But getting it across the threshold required the help of my neighbor Tom Dancer who was salvaging wood from the barn across the street. 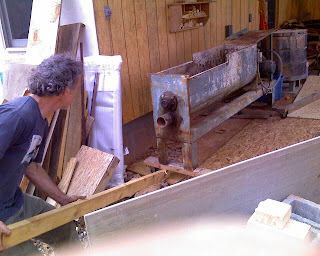 Here's Tom wiggling the mixer into place while I threw my 4" x 4" x 8' lever down to snap this picture on my new Centro! I'm really excited to get some red dirt into this fine machine! We'll get it wired up tomorrow! More on the Paoli mixer tomorrow! 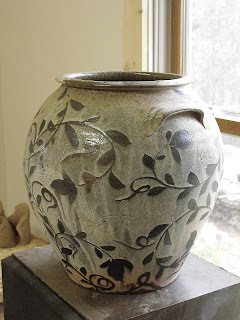 Kathryn Gremley invited me to be part of a show representing the Penland Gallery at the Sparta Teapot Museum. I'll try to get the specifics of the show and pass them on to you all, soon. But for now some informal pictures of the piece I sent. If you click on the image(s) you can see more details, like the incised eagle/hawk that I copied from one of Lillian's school assignments. 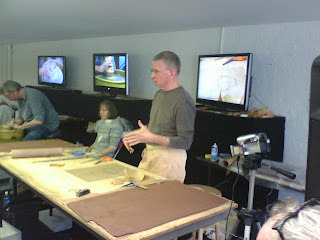 The incising is done while the clay is leatherhard. 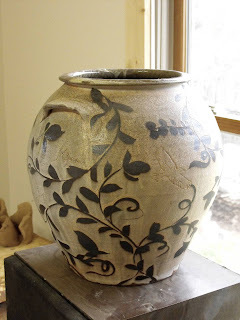 The vine patterns are painted on the pot after it has been bisque-fired. With the last series that I did I tried to incorporate the incised patterns instead of obscuring them with brushwork. It's a tricky proposition, but one I find interesting, of course. More to come soon. I'm getting ready for a big show at the Ferrin Gallery and I will trying all kinds of new stuff! So stay tuned! Despite the advice of my inner director, I left my voice on this video. Here is a short handle tutorial that I put together for my upcoming Greatest Hits DVD. Hope you find this useful. 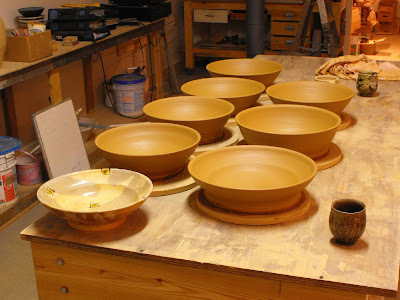 Cut the feet and handled these bowls this afternoon. 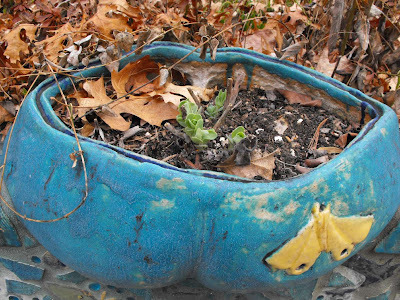 I've been making a version of this pot since about 1991/92! And I've used the kidney shaped rib on all of them until tonight. into the handles to give the destinctive shell look. To get the particular shape on the handles, I use the thin edge of the rib. But I have noticed after all of those bowls the edge isn't sharp anymore. Instead I tried one of these wooden tools (marked MKM) that Reid Schoonover was so generous to give me last Fall at the Arrowmont Conference. The sharp edge on the side of this triangular block of wood was perfect to get a crisp mark on the bowls. I guess I'm going to have to include this handle in my next video. 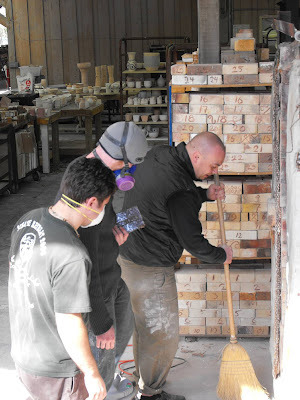 Like a lot of things we do as potters, the tools we use and the sequence and timing of when we do it, determine how the pots look. I will try to write about some of my favorite tools very soon. Some of them I made and some I bought. 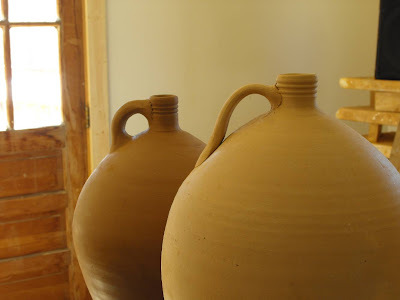 I have just spent 45 minutes looking at the pots at AKAR. The show looks great and seems to be selling briskly. Shoko, Jenny, and Bruce, among others have already sold out. I hope you wil go see for yourself. If anything it is a visual feast! 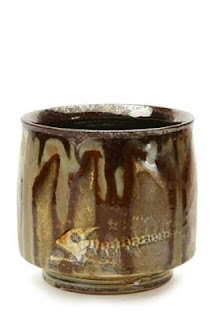 KIm Ellington has some beautiful cups, too! Thanks to my cousins, Samantha and Bruce, over Seagrove way, for delivering my jar to the Pottery Center for their annual auction. The auction will take place on the 18th of April, coming right up. I hope you will be able to make if you're in that neck of the woods. This event is free and open to the public!!! The theme for the auction is "the many faces for the center". I went to the auction last year and had a blast . 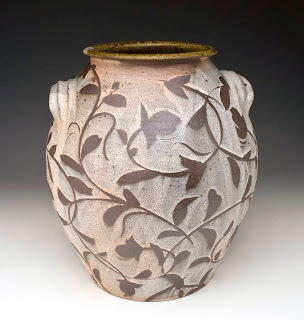 There are all manner of pots and sculptural pieces, beautiful antiques and a who's who of contemporary NC pottery on display before the silent and live auctions. Of course there's lot's of great food and time to sit down and chat. I hope you will be able to support the Center this year. 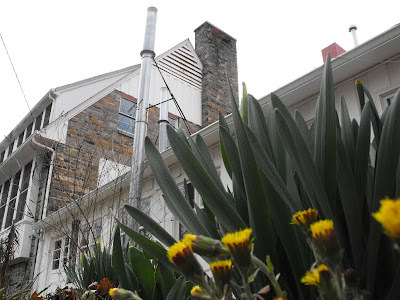 It's a unique place of great importance to our state's pottery history and a beacon to light up the road ahead. Twitter: I've been experimenting with this as a way to share some links, and to share some of the mundane yet interesting things I am doing. Facebook: I have a "fan" page on facebook as well as a personal page. It's been great to "meet" folks from all over the world and have some interesting conversations. It's a great way to stay in touch. Youtube: I have posted a few videos and hope to do more. You can see all of them here. Flickr: I haven't done much with this web site but it has some potential. 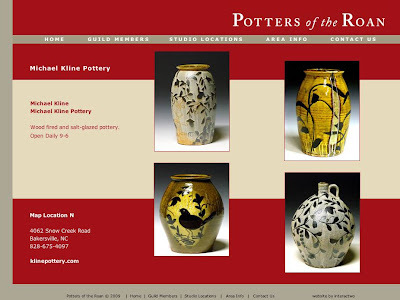 See some pots among other stuff here. Lastfm: This is an interesting twist to online listening. Although I don't stream music online with my dial up connection, the music I listen to while I'm working on the eMc or blogging is logged into my lastfm profile and also updated on Facebook. You can see what I've been listening to here. I'm sure there's more but who has the time when you're surfing on dial-up. Spent most of the day running errands. 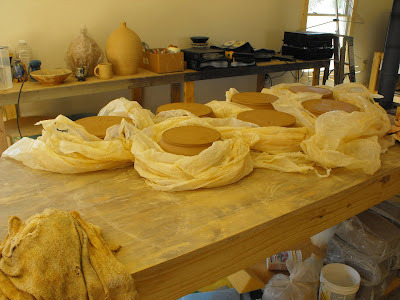 I managed to pack the pots I'm sending to the Mudfire Potters of The Roan Show opening in April. There will be a 2 gallon jar among some plates, platters, some big cups, and yunomis. Speaking of yunomis, the AKAR yunomi show opens in the morning. 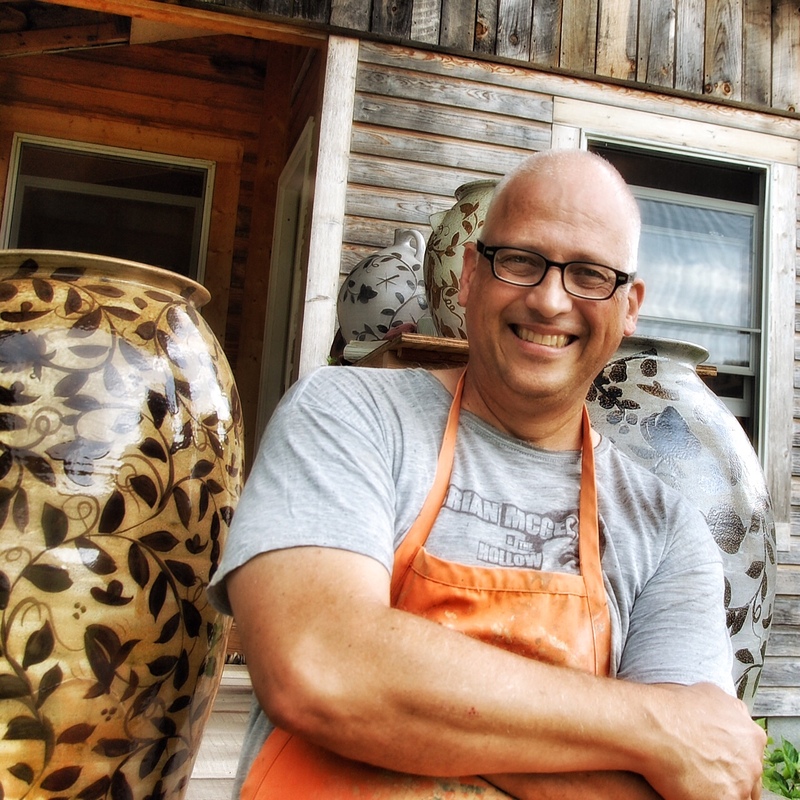 I hope you will see the show and get to buy some of the great pots the show promises to have. 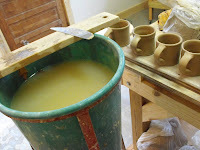 Some of the cups profits will go to the Studio Potter magazine. They are recommending that you register so that your purchases can be expedited without delay. The show sold out pretty quickly last year as I remember, so log on early. I think the show goes live at about 10a.m. EST. I have a few more yunomi that I didn't ship that I hope to post on etsy very soon. I'll let you know when I do that. All this to say that I had but a meager pottery output today. But I had couple of good kicks on the treadle wheel and thought it a more than enjoyable experience. Quality over quantity. The difference in the kick wheel and the old Shimpo is all in the breathing and rhythym. The treadle requires a little more coordination and focus. It's really best for smaller pots, under 4lbs. The old Shimpo has a bit more power and I use it mostly for speed, when I'm in a hurry, and larger sized pots, but it's loud. So for now I'm making smaller pots and enjoying the treadle kick wheel. A board of little mugs that I had made the other day, Saturday(? ), awaited me this morning. After circling around and looking for the right arrangement I ended up with this setup to add and pull handles on them. 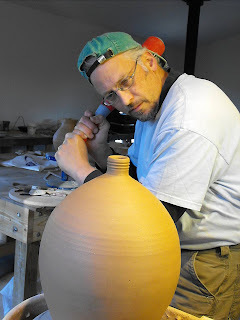 I score the pots with a big serrated rib that Michael Sherrill gave me last Fall. I like using it because it's stiffish (is that a word? ), it fits nicely in my grasp, and makes quick work of scoring. It simply feels better than the small serrated rib I had used for years. Speaking of "feel" my daughters were hanging out the other day when I was throwing these mugs. Lillian decided she would help me, so after a short training session, she controlled the speed of the wheel, as I said faster, slower, etc. 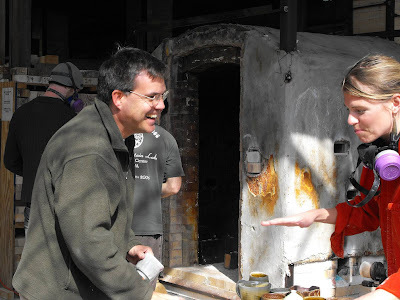 It felt like a team of glassblower's working in tandem on a piece. The crank on the old Shimpo is pretty stiff, but I must say the little gal got pretty good it. While she sat on the stool crankin', she also poked at a couple of the mugs. After a few of those, Evelyn wanted to get in on the fun. 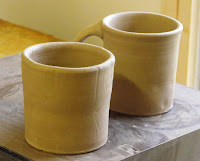 The mug at the right is poked by Lillian, the one on the left is Evelyn's design. I found it interesting that Evelyn decided to make a different mark than Lillian. After E made her marks, L gave it a scratchy try on the next one (always copying her older sister). 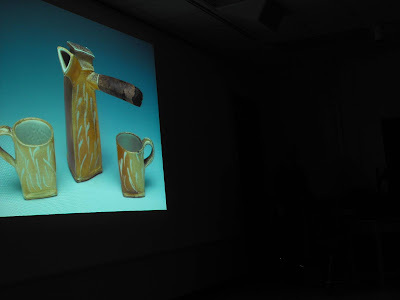 But all of this has me thinking how much these and other small pots are all about the finger tips. 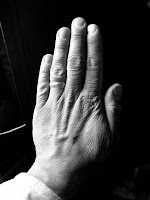 Maybe it's the relative scale of our hands/fingertips and the pots they encounter. Maybe this is a little bit vague. hmmm. One of the things that resulted from my accident a few years ago, was the difficulty of throwing tableware. 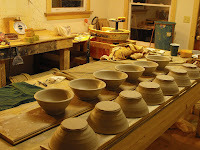 (cups, bowls, production work) My fingers got sore from the repeated finger work required from throwing these smallish pots. 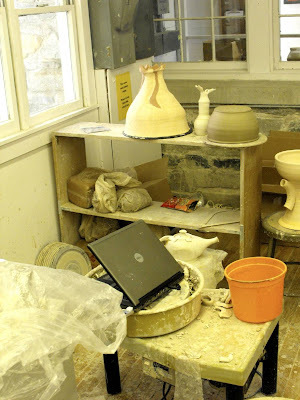 My reaction was to make bigger pots that I could turn with ribs or a curled hand holding a sponge, hence a transition into larger pots that continues to this day. 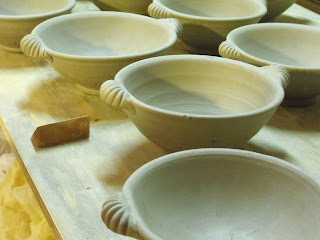 Now, though my fingers are stronger and smaller repeat ware isn't a problem. Just a few thoughts on throwing, which I will now do since my lunch and this post are done! Just when I thought it was safe to just get my circa 1970 Shimpo Scream™ spinning today, I find myself putting a material list ready for my man Buck who is coming over to wire, kiln, mixer, and pug mill. Just when I finished reclaiming/mixing about 500 lbs of clay! Damn™. But I'll really be glad to have the pug mill running again. The circa 1967(?) Paoli mixer pugger will get wired just in time to mix a new batch of clay, too. 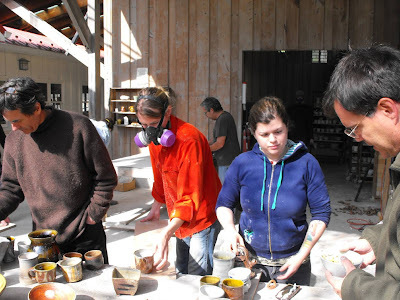 A potter's got to have clay! 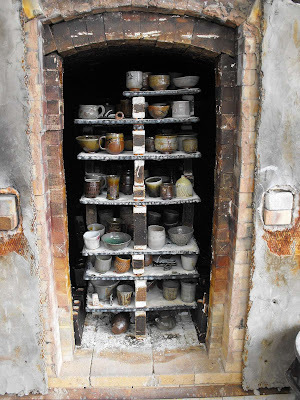 The drying rack is filling up with pots ready for a bisque so I've got to move the kiln off the front porch. All of these things will help with efficiency in the work shop. Besides more time™ in the day, I really need some serious streamlining™. The rain today is a reminder of equipment that sits out in the rain needing tarps, muddy places that need gravel, a kiln shed that's full of leaves and other items of winter's blowing winds. All of this and blogging, too! 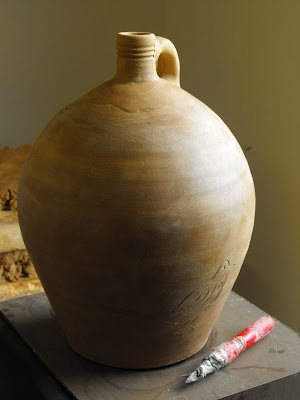 A potter's life is never idle, no time to sit under the shade tree. I'm fairly happy with the handle, it's strong and one finger and a bent elbow will easily be able to lift this pot. The tool I use to scratch birds and other designs into the dry leatherhard clay is one I used in printmaking back in college. It's modified with lots of duct tape. I can't remember what the tool is called, but it has three faces that come together into a sharp point that can be easily sharpened as needed. I got to see my good friend Hayne Bayless in Boone tonight. It was much too brief, but I'm thankful that Lynn Duryea and App State brought him here. Boone, NC is about an hour NE of the Penland/SprucePine/Bakersville area. and had a slide talk this evening. There he is again to the right of this nice coffee set! really. 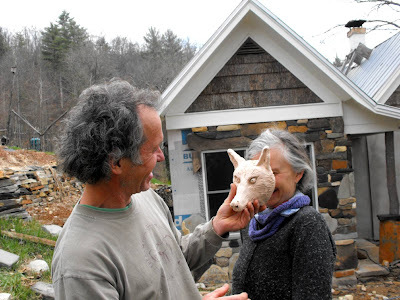 I'm looking forward to seeing him here at Penland this summer July 5th-17th, Session 4.
of cellular phones and wireless internet..
joking around with a wolf mask that Tom made. 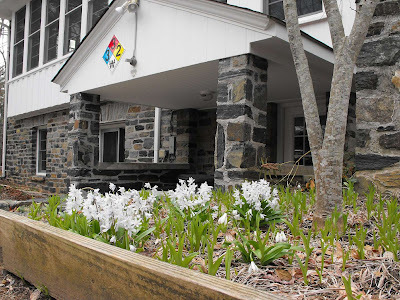 Here are some more pictures of Spring around the Penland School of Crafts. It's abuzzin' up there! 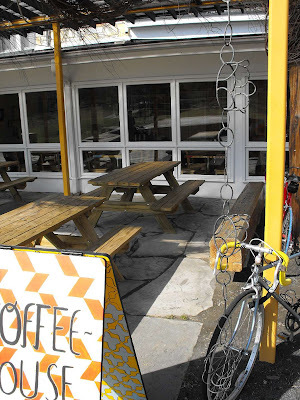 The 'Portico" of the new Penland Coffee House. A good place to meet up! 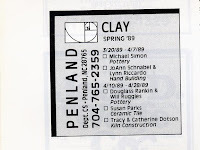 I met Mark Shapiro at Penland on or about March 20th, 1989. Wow, twenty years ago! 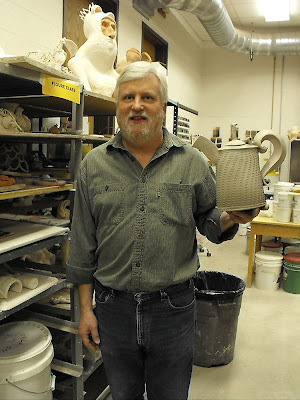 By some vernal coincidence, Mark has been here for a few days to visit and interview Paulus Berensohn and make a few demo's for McKenzie Smith and Gregory Miller's class. Tonight, Stacey, the girls, and I had the pleasure of having him over for dinner. 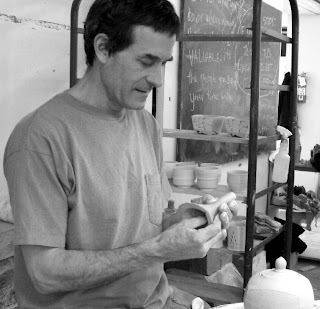 Mark and I took that fateful workshop in March of 1989, along with fellow potters, Sam Taylor, Suze Lindsay, Marsha Owens, and Jane Shellenbarger, to study with Michael Simon who inspired us and a generation of potters to take the chance of being a potter and an artist.Things have changed a lot in the 20 years as far as how students assimilate information at the school but I would bet the experience of being at Penland is at it's core very much the same. It remains a place of intense energy, enthusiasm, and sharing. Penland is a wireless campus! My buddy, Mark Shapiro is in town to interview Paulus and we're heading up to Penland for Brunch! 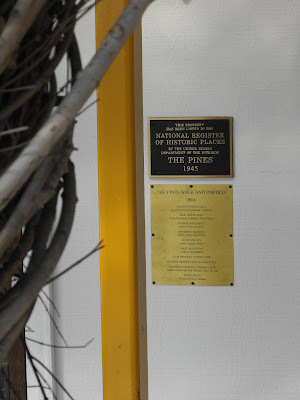 I'll take my camera and do a Penland Ramble for you. 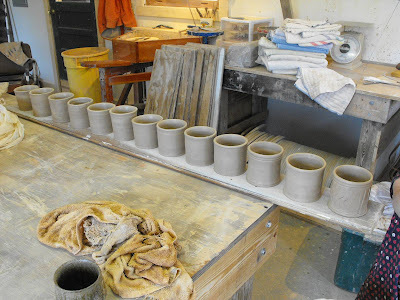 Meanwhile I am tending to these pots later this afternoon! There is something about using a good pot that makes me want to make it. What is that impulse? Maybe trying to figure out how it can be so good, work so well? 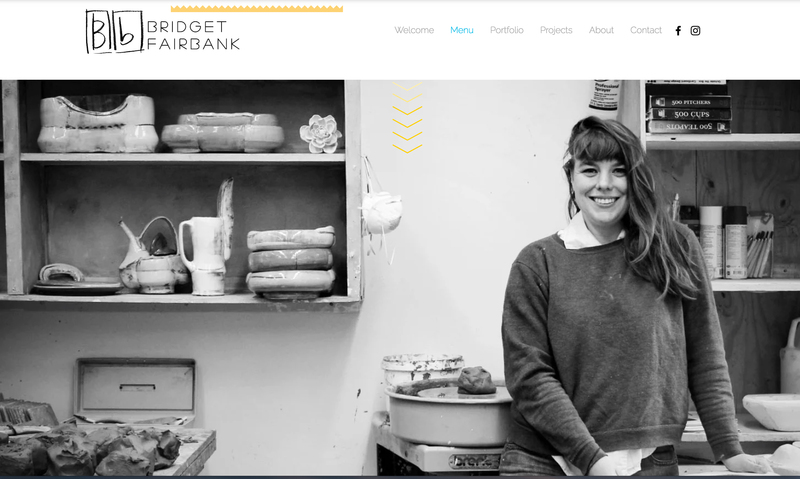 Sometimes I need a springboard to get the pottery flowing. For lunch today I fixed a fettuccine with egg and feta cheese. Something simple and nice for Stacey and I. Stacey was working on her jewelry in her little workshop outside our house and I wanted something hot, but quick. Well, it wasn't that quick but it was simply tasty! I chose a Rock Creek Bowl that was just the right size. It fit on the table between our plates held the 3/4 lb of fettuccine for the two of us. After I cooked and drained the pasta I put it in this bowl and poured the two beat eggs in and tossed. Then I covered the bowl with a big Philbeck goat plate and waited a couple of minutes, checked email, whatever. The I tossed it again and by now the egg was just cooked and covered the pasta. Yum. I tossed in 3/4 c crumbled Feta cheese, plenty of black pepper, and salt. 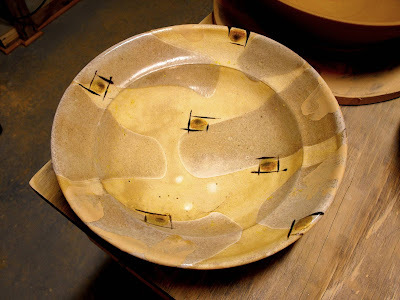 It was so good that we got a good look at the empty bowl and it's odd design and its 'desert storm' palette. It has a shino like glaze that is ladled on or poured on in these nice little areas that break up the space of the bowl quite nicely. It was slipped and salted to a smooth sheen. Then there are these amber dots that are somewhat quarantined within four quick little brush strokes that form a kind of square. These brush strokes are done in such a way that gives the squares a kind of speed or movement. It is sort of a bird's eye view, sort of a map. The bowl has a paradoxical visual weight but feels just right. 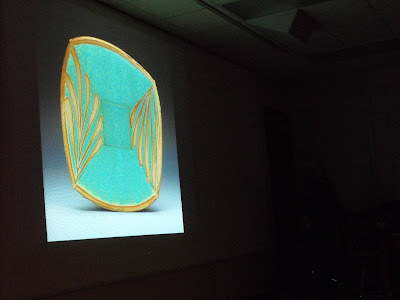 [what I mean is] The outside of the bowl is cut evenly and disregards the inside profile. The inside of the bowl was ribbed into two 'zones'. Well, there are two areas formed by the ribbed ridge. The bottom inside of the bowl is almost flat and then sweeps up to the ridge line before it sweeps up to the rim. 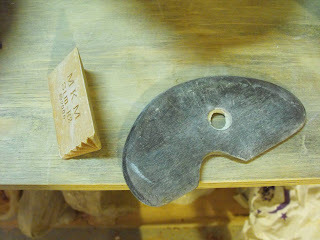 It is cut/trimmed almost all of the way from the foot ring, which is quickly and squarely done, to the rim. The clay is lightly salted, orange in spots and dry in spots. The clay seems to have some sand which breaks up the smooth surface and gives it a subtle texture where the clay is cut. There was another small pot fired and wadded inside the bowl and it left a nice three point mark. Well, I guess that's why I had to try to make this pot. It's too soon to tell as to my success or failure. 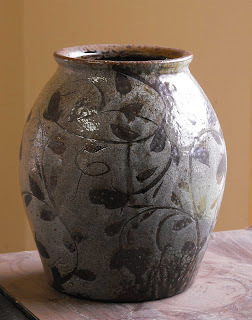 As in many good pots, the proportions are very subtle. The timing of the lunch , picking the bowl, and my abundance of soft clay ready to be turned, conspired with my desire for this bowl. Maybe the fettuccine had something to do with it, too? 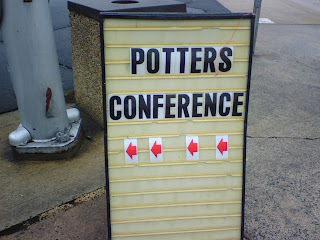 We potters, should try to eat better, and use the best pots available. It certainly doesn't hurt! I followed some advice that Tom Turner gave me concerning my jug handles. [not without some hemming and hawing, though] and I think he was right to say that my handles are to small, which I interpreted as too strappy. The handle on the right is a strappy handle and the one on the left is rounder in cross section. I, myself, like the one on the left. Which one do you favor? These are pretty big pots. The one on the right is about 3 gallons and the left is about 2. So just from that info, with water weighing about 8 lbs/ gallon, the handle has got to be stout. But that's all I'll say. What do you say? P.S. Tom, how'd I do? 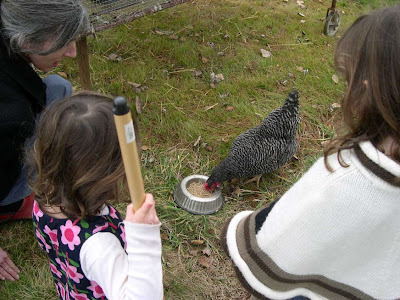 This week we lost one of our hens, affectionately known as "Booger". She was a good layer and we'll miss her beautiful brown eggs. 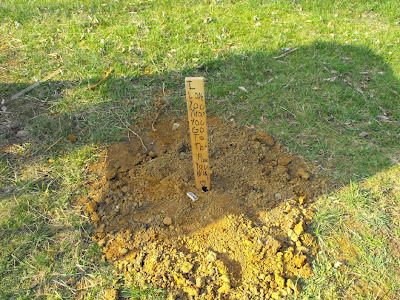 Evelyn and Lillian made these headstone's to mark her memorial in the shadow of the coop. Luckily we will get more chicks soon and Silky will have some company. I'm OK, really. Thanks for all of those concerned about my welfare. I'm just a little behind in all departments and haven't been able to post lately. There has been some pretty good coverage of the conference, though. Here are a few of the stories in case you missed them. 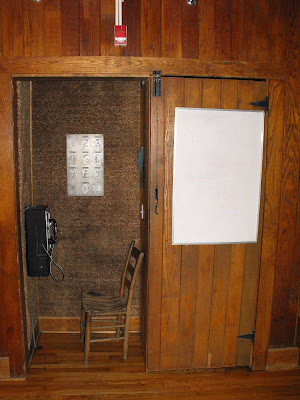 Michael Mahan of Seagrove has several posts about the conference including a recent post of some work inspired by what he saw and heard. 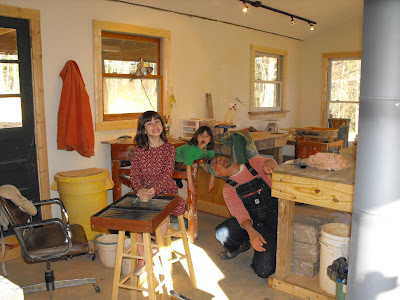 Bruce and Samantha of Bull Dog Pottery have a nice post today and Julie Jones of Durham writes about what she found interesting. Here's Ron Philbeck's coverage! Meredith over at Whynot Pottery caught me having a good time at the Friday Night Dinner and wrote about the conference here. 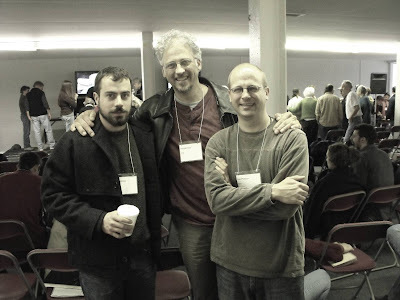 I didn't have the pleasure of meeting Benjamin Gufford at the conference but he has a very nice blog here, with coverage from the event, including some videos which I haven't seen yet (remember, dial up, here?) but will see when we switch to high speed (soon!). Nancy Utterback gave a wonderful presentation to complete the weekend and spoke eloquently about "green" practices in the individual or group studio. She and Melissa Oliveira have started a blog about such . It can be found here. 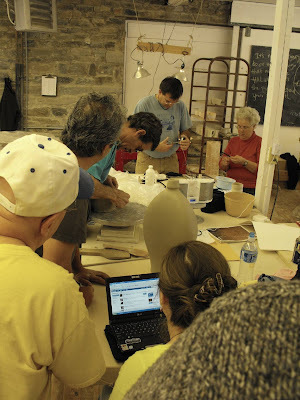 I hope you will contribute to the conversation over at Green Ceramics. It's an important topic in these times. Things get old really fast here on the bloggo-potto-sphere! I hope that I don't miss the already fading deadline to post my impressions of the NC PC in the next day or so. Thanks for keeping in touch.